What are ADHD Boarding Schools? ADHD boarding schools help teens with learning disabilities. These programs provide alternative school environments that help teens with ADHD. The goal is to guide them, and assist in learning, growing, and thriving. Teens with ADHD often find themselves falling behind in a traditional academic environment. Teachers don’t have the time or resources to create individualized learning plans. So, students with ADHD get lost in the mix. Many teens develop anxiety, depression, and defiant disorders. 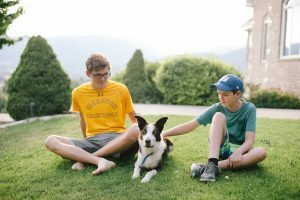 ADHD boarding schools offer guidance and inclusivity through strength-based experiential programs. These programs recognize your child’s potential. They maximize it, and allow them to achieve great things. The staff acknowledges that kids have different learning styles, and they work hard to bring out the best in every student. ADHD boarding schools provide a safe, positive, and therapeutic atmosphere. These programs help teens manage their ADHD symptoms. Professional staff: teachers, doctors, therapists, psychologists, and mentors. Experts have the skills needed to work with teens with ADHD. 24/7 environment. Teens with ADHD need stimulation outside of the classroom. ADHD boarding schools provide round-the-clock care. These programs also offer activities. They engage teens, and help them manage their ADHD symptoms. ADHD boarding schools aim to help teens feel comfortable in a safe environment. They provide an environment where young people with similar needs like and support each other, and teachers and administrators actually give students the individualized attention they need. Who do ADHD Boarding Schools Help? ADHD boarding schools help teens in crisis. Parents consider ADHD boarding schools when their teen is failing in school and at home. Teens with ADHD are “forgotten” in school. Not only do their grades suffer, but the whole experience can make them more anxious. New Focus Academy is an expert in addressing the challenges teens with ADHD face. Many teens are attempting to understand difficult life situations. They need healthier strategies for doing so. There is no cure for ADHD. But, teens can learn executive functioning skills. Adolescents can move forward and live happy, healthy, and responsible lives. ADHD boarding schools help teens that are having trouble fitting in at school. ADHD boarding schools offer a small, safe, and supportive environment. Teens have the opportunity to learn valuable life skills, and practice independent living. Boarding programs also teach teens how to thrive socially and emotionally. 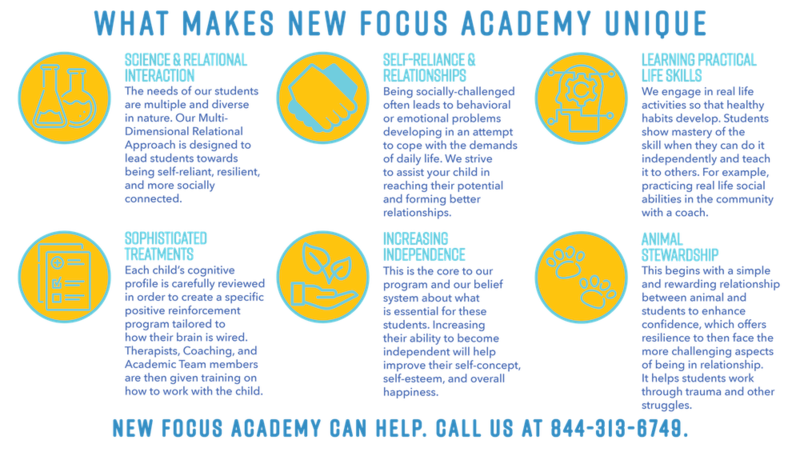 How Does New Focus Academy Help Teens on the Autism Spectrum and with ADHD? New Focus Academy helps teens build brighter, happier futures. Our professional staff guides your son every step of the way. Our team of experts is specifically trained to help teens on the autism spectrum. Teens enter our program scared, isolated, and depressed. They have trouble interacting with peers, and succeeding in school. Our programs bring out the personal strengths of each student. We teach teens to embrace their strongest assets and use them in daily life. We aim to increase development socially, academically, and personally. Using evidence-based techniques to help teens develop. We increase their social awareness, emotional needs, cognitive behaviors, and executive functioning skills. Our staff empowers students to face challenges and build self-confidence. We use the Autonomy Developmental Model to tailor each student’s treatment approach. This model promotes concept-driven learning, which goes above and beyond the classroom. Also, we teach our students social-emotional fluency. Teens manage daily challenges, which helps them succeed in day-to-day life. At New Focus Academy, we help teens learn and grow through positive reinforcement. Our goal is to promote independence at every level. Teens work through their communication, self-care, impulse control, and self-esteem struggles. Our programs encourage, guide, and develop positive life and social skills. Accredited academics taught by licensed teachers. Individualized classroom attention and helpful study techniques. We provide a supportive environment, which promotes self-determination, resiliency, and excellence in learning. Life skill building. Our program focuses on the future. We teach your teen how to enter the real world with confidence. Structure: teens become schedule-oriented. Time is set for school, therapy, study hours, socialization, and exercise. Therapeutic milieu. Our therapeutic approach includes: individual therapy, coaching, group therapy, animal therapy, recreational therapy, and a prosocial environment. 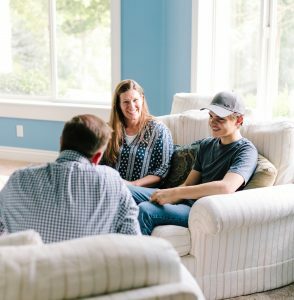 Group sessions: daily group therapy helps teens make meaningful connections. They develop listening skills, and learn to express and challenge themselves. Coaching: each student is assigned a coach on day one. Coaches meet with teens weekly to discuss progress, celebrate successes, make recommendations, and applaud valiant efforts. Social development: teens engage with like-minded peers to develop and form lifelong friendships. Recreational therapy: students learn new and exciting leisure activities. This helps develop social skills, and shows teens how to reach outside of their comfort zones. Active participation in meals. This is one of the best ways to help teens transition into independent living. Students learn every step of the meal planning process. They become skilled at planning, budgeting, and preparing healthy meals. Learning principles behind rules. We teach students how their behavior affects others. Our set of principles includes: community, integrity, respect, responsibility, dedication, and gratitude. Our treatment model is unique. We use the Autonomy Development Model. Our treatment team guides teens through the various stages of autonomy. The main goal is to increase a teen’s independent thinking, and his quality of life. Caretaker: Teens need undivided attention and supportive care. Our team members are available to guide teens through the decision making process. Guide: Team members begin to take a step back, and let teens make their own decisions. But, team members are always available to provide advice and feedback. Teens also learn accountability for the decisions they make. Resource: the student has reached fluency. He is now able to make life-changing decisions with ease and confidence. Team members are there to provide support and resources. They help students make positive, independent living decisions. Each student will progress through our evidence-based levels. Each level increases autonomy and decision-making. Awareness: After a clinical assessment, team members identify each student’s barriers and limitations. Targeting: Team members and students prioritize barriers and limitations. This phase also introduces motivation and preparedness. Strategies: Creating a positive reinforcement plan for adapting and overcoming barriers and limitations. Implement: Students try out their new skills in daily life situations. Team members make continual assessments and recommendations. Fluency: students discern what good, healthy decisions are. They are able to make decisions with ease. Teens put their new skills and abilities to use in every day life. Recent research explores independent living programs for people with autism. Linda Rogen, M.P.H. and Bobby Guercia, M.S. published Autism Speaks Postsecondary Educational Opportunities Guide. Research emphasizes vocational working as a way for “individuals with autism to earn their own money, gain positive self-esteem and recognize their worth in society.” These essential life skills provide both “soft” and “specific” skills for future employment. Education: Curriculum and community-based learning experiences. Teaching should focus on experiential, age appropriate learning. Functional academics focus on enhancing independent living and vocational functioning. Life Skills: “Individuals on the spectrum need clear, incremental hands-on instruction on how to live on their own.” Programs should cover money management, cooking, shopping, room organization, and transportation. Also important are executive functioning skills, such as organizing, planning, prioritizing, and decision-making. These programs are software and evidence-based. They use materials that emphasize hands-on learning, technology, comprehension, real-world words, and executive functioning.